Getting married! Congratulations. This is a very exciting time. When planning your perfect day, whether it is a small intimate wedding gathering, civil partnership or a large lavish ceremony, Glenholme Florists will provide you with a highly qualified and professional design team that you can rely on. Our wedding consultants have a wealth of experience and knowledge. 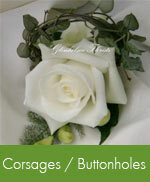 They know exactly how to co-ordinate all the aspects of your wedding. 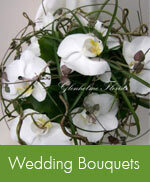 We love working with brides and get great pleasure from making your floral dreams a reality. Details of the bridal gown, attendant’s attire, theme of the wedding and time of year will all be considered, when suggesting suitable designs. Our flowers will create stunning, memorable images that enhance the occasion, as well as beautifully complementing your wedding theme. It is important to us to fulfil your wishes and we will work with you, transforming your vision into reality in a stress-free and friendly manner. Don’t worry if you don’t know the flower names or the bouquet types, that’s what we’re here for. Creating and designing is our speciality. Not only do we create stunning bridal bouquets and buttonholes, but we are also renowned for our amazing and original venue flowers; our striking table centres, our individual floral favours, our gorgeous garlanding, our magnificent floor-standing displays, and not forgetting our all important, memorable “thank you” bouquets. 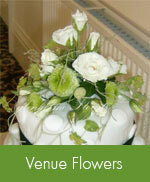 To complement all that we also offer a vase and container hire service. By commissioning Glenholme Florists you will not just have one person but the knowledge of a highly qualified, enthusiastic and professional design team, with a wealth of experience that know exactly how to co-ordinate all aspects of your wedding day. What to do next? Contact us as soon as possible to reserve your wedding date. Let Glenholme Florists help you take the stress out of the organising and enable you to relax and enjoy the experience. We look forward to your enquiry. Your wedding, our flowers, the perfect match.